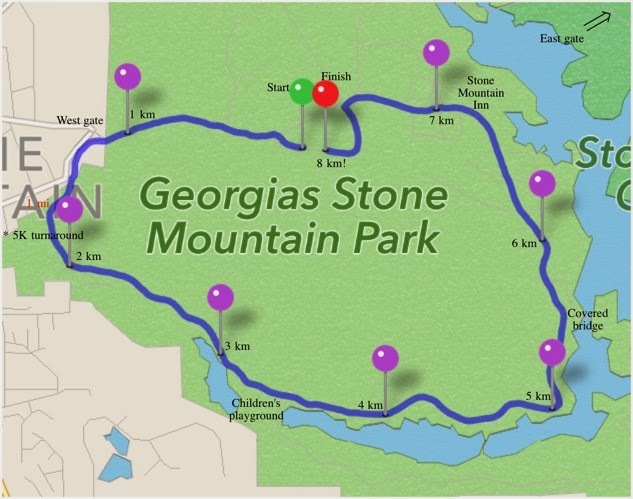 For the first race of 2014, we have found a race around the base on Stone Mountain, which covers 8K for one circuit. Moreover, they offer a 5K option. As Bonnie and I have been walking Stone Mountain and completed our first circuit on December 25, I proposed to sign Bonnie up for the 5K, and she accepted! The Fun Run / Walk is hosted by a family foundation, Livvy’s Love, which the Hayes family named as a memorial to their daughter, who had died in an accident about five years ago. The proceeds from the run will support college scholarships to graduates from Tucker High School, so we were excited about both the cause and the venue. Friday evening, January 17: I’ve picked up our tags and packets on the way home from work. I’m really excited that we’re both actively participating in the run / walk. 8K is a good distance for me, and Bonnie has greatly improved her fitness over the past year so that we have no concerns about her ability to complete the 5K. She has begun using the C25K app, alternating running and walking. However, the weather is turning colder, and the forecasted temperature for the start at 8 am tomorrow morning is a frigid 25 oF. Bonnie has already given me some cold-weather running gear, but she doesn’t have the appropriate gear for herself, so we do some last-minute shopping at Sports Authority in the hour before closing time. She finds a long-sleeved running shirt, a purple running jacket, running gloves, and a hat. I also pick up a blue skullcap, and some chemical warming packets for our hands. After we get home, I try to turn in early for the night, with a 6:00 am alarm, although it’s past midnight before I fall asleep. However, the last thing that I see is Bonnie working on her iPad, studying the route map for the race! I’m so pleased that I’ve not only afflicted Bonnie with my new-found passion for running, but have also infected her with an appreciation for maps! Saturday morning, January 18: For some reason, I did not sleep well last night. I’m overly excited, even anxious, about the race, and I’m out of bed by 5:30 am. I’ve had some good times in previous races, but have not been able to get even close to those times in practice runs. I definitely don’t want to regress after having four good races in 2013, with steady improvement. However I’m well prepared for the race, having run the route several times, and having some familiarity with the location, height, and number of hills along the route. I eat my typical pre-race breakfast of oatmeal and cappuccino, and after Bonnie is up, also prepare banana-blueberry smoothies for each of us. We leave the house exactly at 7 am, and arrive at the Stone Mountain parking lot at 7:25 am. After putting on the last of our gear, we open the chemical hand warmers, squeeze and shake them, and I feel a little heat after a couple of minutes. The package states that it takes 20 minutes to reach peak heat, about 135 oF. We join the gathering group, and find that most participants have found shelter in a heated tent. A man, slightly older than me, asks me about running in Georgia, and I admit that I’m new to the sport, having started only last year. His name is Marlin, and he has recently moved to metro Atlanta from Utah. When I ask him about his races, he answers “I don’t run the ultra-marathons. But last year I ran five marathons.” Despite his experience, Marlin is a modest person and doesn’t flinch when I tell him my longest distance is 10K and that at my best I’m running a 9-minute mile. About 5 minutes before the scheduled race start at 8 am, we are coaxed from the heated tent, and join a small group doing Zumba exercises. I join in vigorously to keep warm. In fact I don’t think that Bonnie has ever seen her husband dancing so much. But I’m getting stretched out quite nicely. I can’t see the time but I’m sure that it’s past 8 am when we are finally encouraged to gather at the starting area. I’m the first person there, and do a quick sprint on the roadway behind the starting line while the area is clear. Then I realize that it might look like I’m showing off, when 1) this is a Fun Run, and 2) I’m a middle-of-the-pack finisher. But it feels good to sprint, so I take on more one jaunt, just a little shorter, then circle back to a position about 10 meters behind the starting line. Bonnie joins me there, where we try to listen to pre-race instructions, although it is hard for me to hear over the roar of the generator powering the heated tent. Nonetheless I get the essential information about ice patches on the roadway, and the turnaround for the 5K runners. A small group sings, which a few bars in I realize is the National Anthem, although it is difficult to hear without amplification. Only as the singing is ending do I realize that no one other than Marlin, on the front row, has removed caps and hats, but it IS cold and it is difficult to hear. I give Bonnie a kiss and wish her a good race. The official gives the signal to get ready, and then we’re off! It feels great to begin, and I quickly reach to a comfortable pace as we leave the starting area. Oops, I realize too late that I’ve completely left Bonnie behind. I ran off without her. Hopefully she will forgive me. The first kilometer: The first part of the race is a gentle uphill section. Fortunately this is ideal, as I’m feeling strong and so it isn’t particularly difficult. Moreover, it probably helps to keep me from starting too quickly, because in other races and practice runs, I tend to start too quickly and then slow down too much at the end when fatigue sets in. There is some ice along the left side of the road near the curb, so I resolve to stay at least half a meter from the curb for safety. A few people are running on the sidewalk, until they encounter the first ice patch, at which time everyone moves onto the roadway. There is a little traffic and the road is not officially closed, but the starting section is a four-lane roadway, so there is plenty of room for runners in the right lane (relative to the direction of vehicle traffic) with oncoming cars in the left lane. I cover the first quarter kilometer in 1:30, so I can safely increase my speed a bit. I start to pass a few of the runners, while I focus on form and maintaining a steady cadence. I complete the first kilometer while approaching the west gate (towards the village of Stone Mountain), at 5:13. It’s a great time for me considering that most of it was uphill, and I just hope that I haven’t started too quickly. The second kilometer: After we pass the museum in Confederate Hall, there is more automobile traffic as we approach the main parking lot for visitors that are climbing the mountain. Bonnie and I climbed the mountain in August. The police are controlling vehicle access so that we can safely run through the first intersection. There is a reserved pathway for us through the parking lot parallel to the road, then I run through the second intersection. The sidewalk goes to the main road, which at this point narrows to a two-lane road, with one-way automobile traffic on the right, and a left lane divided for pedestrian traffic on the left and bicycle traffic towards the middle. This begins my favorite part of the circuit, as the next four kilometers will pass the south side of the mountain, with minimal traffic. Shortly after I pass the one-mile marker, a runner comes back in the other direction, running down the bicycle lane, then another and a third. I realize that these are the leaders in the 5K, who have already reached the turnaround point and are racing back to the finish line, near the start. Then I round a corner to see the abandoned railroad bridge to Stone Mountain Village, along with the turnaround sign for the 5K runners. I didn’t realize that the turnaround would be this early in the race. As I run straight past the turnaround point with the other 8K runners, I smugly think, “REAL men run the 8K, not the 5K!” Let’s hope I don’t regret that thought. We start heading downhill as RunHelper sounds the 2K mark, finishing the second kilometer in 5:24, 10:37 total elapsed, a 42-minute pace. The third kilometer: I try to relax and take longer strides in the first significant downhill section, and feel myself pick up speed quite nicely. For a moment, I’m running directly into the sun, which is momentarily unpleasant even with sunglasses, but as the elevation drops the sun is less intense. The adrenalin of the start has lifted and I’m starting to notice that my lips are dry and my hands are extremely cold. I should have put on some Chapstick. I definitely need to remember that before my next cold-weather race. Also, the hand warmers are barely warm, and definitely not warm enough to keep my hands comfortable. I put the hand warmers in my pockets. Fortunately the long-sleeved running shirt has thumbholes to provide partial protection for the hands, and there is enough room to draw my fists completely into the sleeves. That is MUCH better, and my hands are not cold for the rest of the race. This section has no long level areas, just mildly rolling hills. I am only rarely passed by other runners and am occasionally passing others, especially on the uphill, where I am able to focus on maintaining pace. I seem to be struggling less than some others going uphill. I’m thankful for the advice that I had read in several places about working on uphill running to improve speed and conditioning. It’s paying off nicely. The third kilometer alert sounds 5:22 as I near the Children’s Playground, 15:59 total elapsed. I’m two full minutes ahead of my “minimally acceptable pace” of 6:00 minutes per kilometer! Now to keep it up. The fourth kilometer: I pass the 2-mile marker just past the Children’s Playground. The mountain rises gracefully above me to the left, and a beautiful vista of trees lining a lake is to my right. Despite the cold air, I am really enjoying the views, my legs feel good, and my breathing is steady. In fact I think that my muscles are now perfectly warmed up. The run is going well. Then I am passed by a younger, stronger runner, who is obviously way out of my league (why did he start out so far back?! ), but I’m keeping up with everyone else without difficulty. In fact this proves to be my fastest kilometer, at 5:10, and 21:09 total elapsed, at the halfway point. I doubt that I can achieve a 42 minute finish, because I know that there are some significant hills ahead, but I’m feeling good and focusing on maintaining a good pace. The fifth kilometer: This is another pleasant stretch, with mild undulations uphill and downhill. The time passes quickly as the road continues along the lake, with slightly different views with each gentle turn. There are a few recreational walkers coming from the other direction on the road, but no vehicle traffic other than a solitary police car that passes slowly. I hear the sound of cheering up ahead, and then come around a corner to see a group of about 10 people, at the bottom of a hill. There is a 100 meter gap to the runner ahead of me, but they begin cheering again as I approach, and then I realize that it’s also a water station. A woman stands out in the roadway with a cup of water, I slow down a little to accept the cup, gasp “Thanks!” and take a gulp only to find that the water is ice-cold (of course! ), and too cold to drink comfortably. I have to spit it out, then cautiously take a smaller sip, before dropping the cup and the rest of the water into a garbage can along the side of the road. Having slowed down, I have a little trouble regaining speed, but focus on form as I head back uphill as I pass the three-mile marker, and the five kilometer alert sounds, 5:42 and 26:51 elapsed. Not quite as fast as my Phiddippides 5K in December, but not bad considering that I must save some energy for three more kilometers, with several uphill sections to come. The sixth kilometer: The road turns to the north. I always get the feeling in this section of “returning to civilization”. The covered bridge to an island comes into view to my right. Many good memories of walks with Bonnie come to mind, from the parking in front of the bridge, and family picnics with Bonnie’s parents, brother and sister on the island. I think of the tree on the island where my father-in-law wants us to spread some of his ashes when the time eventually arrives, but “That would be illegal” and chuckle at the memory of his story about his son-in-law costing him thousands of dollars for a legitimate plot at the Arlington Cemetery on the north side of Atlanta. At the top of a hill, the roundabout for the Gristmill and covered bridge comes into view. This is the end of the bucolic section. Heeding the sign for pedestrians to move to the sidewalk, I dutifully follow the law as the street returns to a four-lane, two-way roadway. The alert for the sixth kilometer sounds, 5:54 and 32:45 elapsed. The seventh kilometer: This will probably be the most challenging kilometer, but at least I know that from having run it a few times before today’s race. None of the hills are steep but this section is steadily uphill, past the parking lot for the Skyride to the top of the mountain. At least it’s not a surprise. A policeman is stationed at the four-mile mark, and I try to smile and say “One more to go!” He responds with encouragement “Almost there, not much further!” I’ve definitely slowed down going uphill, but at least I’m not having any pain in this stretch (which had happened a week earlier, when I had to stop). I keep thinking that I’m hearing footsteps behind me, but I can see my own shadow stretching at 10 o’clock, ahead and to the left, and don’t see a following shadow. I quickly look behind to be sure, and I think that I might see someone 20 meters behind, but not certain. I just remember that this is a “Fun Run” so I need to move over on the 1-meter wide sidewalk if I sense that someone is going to pass me. A blocking maneuver would be really uncool. I reach the top of the hill at the end of the seventh kilometer. This stretch was 6:20, which is a little disappointing, but under the circumstances probably the best that I can manage. Total elapsed time, 39:05. A 42 minute finish will be impossible at this point, but I think that the hardest part is over. The eighth and final kilometer: My optimism is rewarded as I reach the main intersection with the road going out to the east, main gate, and I turn left towards the finish area. Downhill! I focus on lengthening my stride while leaning forward to increase speed, to take advantage of the slope. There is now definitely someone hot on my heels. As I reach the intersection to the finish area, the person behind me is unsure if he should go left or straight and asks the guide for instruction. I know that I should turn left here (of course I carefully studied the map, several times), but not sure if I should turn before or after crossing the intersection? The answer is provided by the guides: cross the intersection and then turn left. Upon making the left turn I immediately come up on a group of walkers, as this is the place where the 8K runners meet the 5K route, and we share the same finish line. I call out “Passing on the left” and step off the sidewalk to safely pass the walkers on the street. In fact it feels like I’m zipping past the walkers. The person behind me is calling out “Passing on the left” every few seconds, whereas I’m satisfied that I have room to pass by staying on the street. I’m determined that he will not pass me, and I run as fast as I can manage. I’m audibly groaning with exhaustion on occasion, but I’m not going to slow down now. I turn right past a police car that is blocking traffic, and see great news and not-so-great news: The finish line is ahead, the clock shows 44 minutes, but the very last stretch is slightly uphill. Then a young boy catches me on the left (not the person who was calling “Passing on the left”) and pulls ahead of me. I find one last calorie of energy and catch up with him. We are clearly racing each other to the end, and the people at the finish realize it and are cheering us on. There is another runner ahead of us who is moving much more slowly. Unfortunately he is directly in front of me, and I must slow down in the last few meters to avoid running him down. So I’ve finished third in this little group of three, but still a strong race. By avoiding the collision at the finish line, I failed to see the time that I crossed, but I stop the RunHelper at 44:30, then stagger to the side of the road, then catch myself to stand up straight again. I walk back along the side to the finish line to confirm the clock (now reading 45 minutes) but I’m really happy that I finished in less than 48 minutes. Epilogue: I see a box of bananas and pick one up. However, an hour in 25 oF air has partially frozen the banana, and although I can eat it, it isn’t particularly tasty. I text Bonnie that I’ve finished, in case she is able to check her phone. I pick up a water bottle, and try to regain my equilibrium when I realize that Bonnie has just crossed the finish line. Oh no! I was supposed to ready myself to photograph her finish if I completed my race first. Sorry Bonnie! (for the second time this morning). There is a break in the finishers, so Bonnie walks back to the finish line and we “stage” a photo of her finish. We warm back up in the heated tent. Volunteers and donors have provided delicious pastries, ham quiche, some sausage and egg biscuit sandwiches, Powerade, and hot coffee. I settle for a small pastry, a quiche (really delicious) and hot coffee. I asked Marlin his time, and he finished in 41 or 42 minutes. So I wasn’t too far behind this experienced runner. The Zumba exercise is still going strong – where do they get the energy? Then I realize that none of them are wearing runner’s tags. Around 9:15 am, we all go outside for the award ceremony. I’m dancing again, to stay warm. They announce all of the 5K winners first, including age group winners. There are gaps in the runners, for instance very few age 20-something runners, and also no runners over 70 years old. Finally, it’s time to announce the winners of the 8K. The top finisher crossed in 32 minutes, and strikes a great pose with his trophy. The Hayes family is personally congratulating the winners and posing with them for photos, which is a really nice touch. I was very pleased with my race, and the field is relatively small, so I’m hoping that perhaps I’ve placed third in my age group. When they call out the male winner, age group 50 – 54, I hear my name, and can hardly believe it! My first-ever athletic award! It’s sweet vindication for the kid that was picked last for teams in gym class. I accept my medal, a warm handshake from Norman Hayes and a big hug from Nikki Hayes; they are Olivia’s parents. Marlin won the 65 – 69 age group, at 41:35. Sunday, January 19: The official race results are posted: 43:59 for me, and 47:33 for Bonnie. It turns out that I wasn’t the fastest in my age group: the overall winner of the 8K, at 32:55, was a 50-year-old man. I actually finished in second place, out of four runners in the 50 – 54 age group. I was ninth out of 43 runners altogether in the 8K, so that’s pretty good for me. A year ago, the 8K (5 mile) distance would have been a very long walk. If I had even thought of entering such an event, I probably would have finished at or near the end. Goal: To circle Stone Mountain in 48 minutes or less: Achieved!